Hopper silos are designed to store grains, seeds, legumes, pellets and other products that require special storage conditions. The stored product stays off the ground to prevent moisture and lower the possibility of breakage. This type of silo not only brings economic savings, as no sweeping machine is necessary, but also simplifies the foundation work which considerably reduces the building costs and streamlines assembly work. Our range of hopper silos covers capacities ranging from 43 m3 to 2,016 m3 with diameters from 3.82 metres to 10.70 metres. Hot galvanised end support structure. The support structure, which is made up of hot-dip galvanised structural profile columns braced together with laminate profiles, guarantees high silo resistance against external forces. For easier assembly, the silo is supplied with chemical anchoring elements which may be installed once the silo is completely assembled to prevent problems with the construction work. 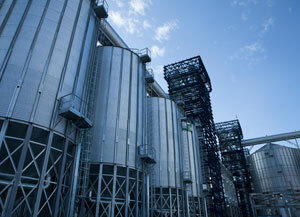 Cones with slopes of 45º and 60º may be supplied for proper silo unloading and to guarantee cleaning afterwards. Our cones are meticulously designed to this end to prevent any area where material may accumulate and, thus, contaminate the product during later uses. The silo outlet dimensions vary between Ø270 mm and Ø1200 mm, and may be completed with a wide range of accessories to adjust the outlet dimensions to your needs. 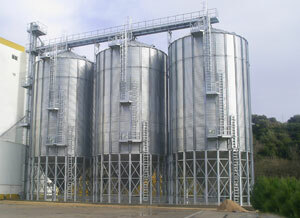 The clearance between the silo unloading and the ground may be 1 or 1.5 m, depending on the requirements for each system. This height may be customised upon request. 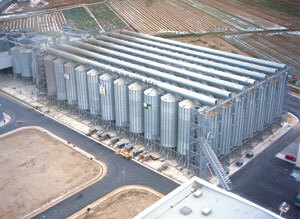 The inner ventilation conduits on the silo are made up of highly-resistance perforated metal cylinders. The number and position on the silo cone guarantee even air distribution in the stored grain mass. The design of these conduits creates minimal grain friction during unloading which reduces stress on the silo cone and the accumulation of grain during unloading. The vibrating bottom helps to unload the products stored in hopper silos with poor flow characteristics like flour, granulated poppy, small shells, carbonate, soybean meal, etc. Recommended for silos with a 60º cone that is reinforced to adapt to the vibration. It is available in different diameters and we adapt it to different silo outlet dimensions. In order to meet our clients’ needs, our technical team has developed a FLOW MASS unloading system which consists of a central cone that is inverted with respect to the silo cone. This prevents the formation of preferential unloading channels where the walls and lateral opening are designed to compensate for mass flows as well as providing a balanced distribution of the incoming air.